WASHINGTON – Prescriptions are not enough–diet changes and nutrition education make the difference in people with diabetes, according to a study published in the Journal of the Academy of Nutrition and Dietetics. Researchers from the Physicians Committee for Responsible Medicine set up a study in a private endocrinology office in Washington, D.C. After working hours, the researchers put the waiting room chairs in a circle and conducted free nutrition classes for diabetes patients. Although the patients' diabetes was generally well-controlled at the outset, the classes significantly improved their weight, blood sugars, and cholesterol levels. Two different diets both proved effective during the 20-week study: a low-fat, vegan diet and a portion-controlled eating pattern. Both groups ate less meat and less fat and cholesterol. These results suggest the potential for a simple, inexpensive dietary intervention to improve diabetes management. "Doctors can turn their waiting rooms into classrooms. It's simple and very effective," says study author Neal Barnard, M.D. "Patients learn about healthy food changes, and can share tips, swap recipe ideas, and work through challenges together." "Being in a class with other people who have the same goals has kept me on track," notes one study participant. Previous studies have shown that dietary interventions are effective for diabetes management, because unlike medications, they typically improve several health markers simultaneously. Plant-based diets, which are free of animal fat and cholesterol, are especially beneficial, because they treat the root cause of type 2 diabetes by reducing fat inside the cells, which improves insulin function. Plant-based diets also benefit body weight, lipid control, glycemic control, and blood pressure. "Nutrition is one of the most powerful tools we have in the fight against diabetes," adds Dr. Barnard. "This study shows that even clinicians who are pressed for time can harness that power by offering group instruction to their patients." More than 100 million Americans now live with prediabetes or diabetes, which is a leading contributor to cardiovascular disease, blindness, amputations, and renal impairment. 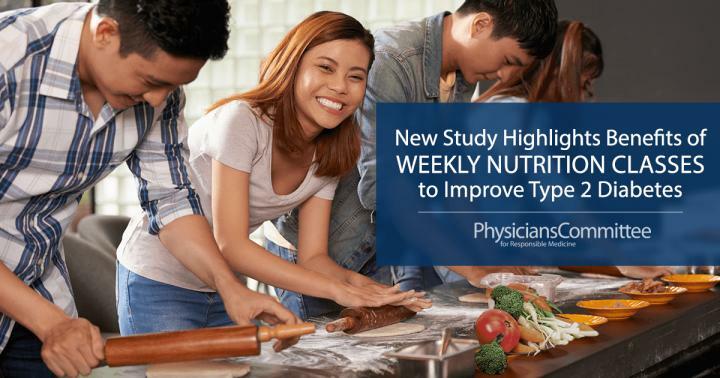 The Barnard Medical Center in Washington, D.C., already puts this information into practice by offering weekly nutrition education classes and support groups for patients. To learn more, visit BarnardMedical.org.